Growing up in a home with five girls was....ummm...interesting. Especially since there was only one bathroom. Now that we are all adults though (technically) I think we have what can be a rare quality. We all like each other. Ok we love each other. Now that doesn't mean we have fairy tale relationships, but I know that push come to shove any of my sisters would be there for me in a heartbeat. No questions asked. 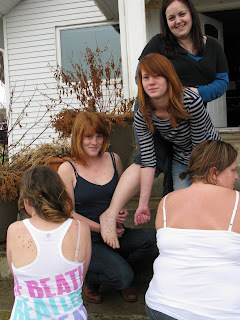 Several years ago the idea came up that some day we should get matching sister tattoos. Awhile later my sister Britta made us each necklaces with the Pleiades constellation which is the 7 sisters. We all agreed that it would be perfect for our tattoos. The idea has been tossed around for awhile but got kind of thrown together that everyone was going to be here this last weekend. Maiken made an appointment and we all piled into the tattoo parlor. 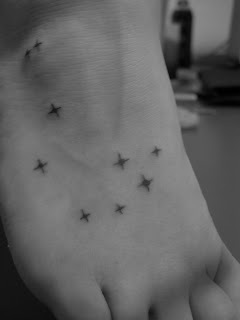 Britta, Alex and me ended up with the same design (star bursts) and Maiken and Keeley went for circles. Different locations, different colors, but all the same constellation. There was much hand holding and much laughing. It was a very special moment and I now smile every time I look down at my foot and see the little stars representing the support I will forever have with me. My sisters. It seems as though Foto Friday is taking a turn more along the lines of random than say improving any photo skills. But that's ok. I like random. First, this is a horrible shot, other than you can still see how much fun Will was having. Maiken and I took Will and Lucia to a free kids science day at The Center. They had all sorts of experiments that you could walk around and do. But the kids favorite part....they just had the Tumbling Tots room open and they could run around and play. Will loved this tumbling wedge and spent almost the entire time running, rolling and hopping down it. Just to prove they did have actual experiments, Will shooting off an Alka Seltzer rocket. From a walk around the neighborhood. Hard times living along the tracks. Very definition of random. Driving back to work on lunch, pass the Waste Management facility. There were two large roosters perched on top of an electrical box. At first I thought they were fake and then saw one move. I had to flip the car around and get a picture. There is a fence in between us but they were not bothered at all about me being there. So they definitely have expose to people. I wish I knew someone in that department cause I'm gonna have to try and find out more about these roosters. Looking forward to next Friday because by then I will have pictures of SISTER TIME! Yay! I didn't get a chance to take long lunches this week so didn't get to go out and take photos. So these are just kinda random. Taken at the Orem mall. Gotta love these chances. And I'm just excited about this new dresser I got that used to be my great-aunts. Maiken helped me re-arrange my room and I'm excited for the change. Now I just need to go through those boxes of things I've had in storage forever and pull out some of the stuff I never had room to display. 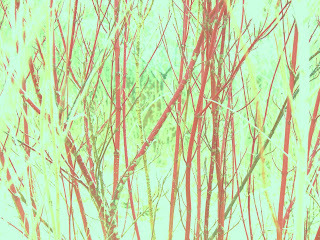 When I started this photo thing for some reason I was picturing that it was spring already and that we were at that time of year when it doesn't get dark till 8 p.m. Since we are not there, it has sort of hampered my picture taking time. I've been limited to what I can do on lunch. Luckily I happen to know of a few parks in the Provo area. These were from a recent stroll in the wetlands area of Bicentennial Park.